Until his imprisonment for anti-government activities and the consequent dispersion of his flock, the Coconut Monk (Dao Dua) led a small community on Phoenix Island (Con Phung), a few kilometres from My Tho. The Coconut Monk left his family behind to pursue a monastic life and he sat on a stone slab under a flagpole and meditated day and night for almost three years. In its heyday the island was dominated by a somewhat trippy open-air sanctuary (admission 5000d; 8-11.30am & 1.30-6pm). The dragon-emblazoned columns and quirky tower, with its enormous metal globe, must have once been brightly painted, yet nowadays the whole area has become faded, rickety and silent. However, it is seriously kitsch, with a model of the Apollo rocket set among the Buddhist statues. With some creation you can almost see how it all must have appeared as the Coconut Monk presided over his congregation, flanked by enormous elephant tusks and seated on a richly ornamented throne. Plaques on the 3.5m-high porcelain jar (created in 1972) on the island tell all about the Coconut Monk. He founded a religion, Tinh Do Cu Si, a fusion of Buddhism and Christianity. Representations of Jesus and the Buddha appeared together, as did the Virgin Mary and eminent Buddhist women, together with the cross and Buddhist symbols. Today only the symbols remain, as the Tinh Do Cu Si community has dissolved from the island. Private boat operators can include the island as part of a fixed tour. You can spend the night at the simple Con Phung Hotel (075-382 2198; www.conphungtourist.com; r from 200,000d). There are river views in the VIP quarters, but almost every rooms also have TV, fridge and hot water. The restaurant serves a a wide selection of delta-flavour dishes (mains from 40,000d). It takes travellers only five minutes from My Tho to get to Dragon Island (Con Tan Long), which is famous for its longan orchards and makes for an enjoyable stop and stroll. Many residents of the island are shipwrights, and the lush palm-fringed shores are lined with wooden fishing boats. The island has some little restaurants and cafes. 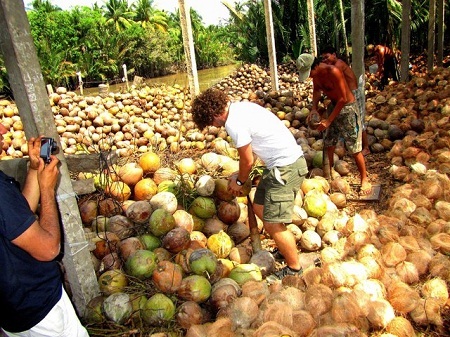 Tortoise Island (Con Qui) and Unicorn Island (Thoi Son) are common stops for the coconut candy and banana wine workshops. Across the river in Ben Tre province, this former ferry stop has faded into obscurity with the opening of the new bridge. The only highlights to visit are to chill out in its rustic guesthouse or to visit its riverside restaurant – a popular stop on the river tours. (075-386 0009; thaonhitours@yahoo.com; Hamlet 1, Tan Thach Village; r US$6-15) It’s a basic homestay-type experience amid abundant greenery with nice rooms and bungalows with fans in each. There are hearty meals, free bike rental and the owner’s son speaks excellent English and also offers tours for visitors. (Hamlet 2, Tan Thach Village; mains 50,000-80,000d) Set in landscaped gardens complete with chickens and buffaloes, this beautiful island restaurant does a roaring trade with many tour groups discovering the delta. It just serves lunch only. Part of Chau Thanh District, Tan Thach is 6km north of the Ben Tre bus station (30,000d by xe om); take Hwy 60 back towards My Tho, veer right at the big intersection marked Chau Thanh and follow it to the end. The last narrow road to the right is the guesthouse and restaurant; Thao Nhi is signposted to the right after 300m, at which it’s a further 50m down a small lane.